Oh look, 6.31 Hen now also has a signed installer allowing you to install 6.31 Hen without running the Minna no Sukkuri demo exploit as instructed in the original post. With Liquidzigong’s release of a signed 6.31 PRO, you can run it directly from your XMB. Again, the Signed 6.31 will run plugins but not those that require kernel access (like those requiring 1.50) but for the most part, it will run the most basic plugins like Light VSH menu (included in this guide), screenshot plugin, etc. Update: Added installation of Light VSH Menu. Why is it at the start of the installation process? So you can immediately load it after installing the Signed 6.31 Hen. A bit of warning, this Signed 6.31 Hen PRO does not include HBL (Homebrew Loader) so you may not be able to run plugins as some of them require kernel access. Still if you’re just looking to load ISOs on your PSP then this is as simple as it gets. If you still want to run homebrew applications however, I’d recommend the 6.31 Hen over this. If you’re not on 6.31 OFW, follow this guide on how to upgrade your PSP to 6.31 so you can install Signed 6.31 Hen: HowTo: Upgrade your PSP to 6.31 OFW. Thank’s for the efforts, by the way! Should i delete any files in my memory stick? The only thing i have modified since i got him, was the prometeus with the exploit and some savedata. Thanks again, and sorry for my bad english. Well, i did everything according to the instructions, and its working just fine. Some games just don’t even start, but I wait till the compatibility issues get settle playing other games, leaving the problematic ones to later. Do you have VSH working as well? In any case, yeah, we’ll be waiting for a Prometheus ISO loader update. Yeah, VSH is working ok, i did just like you posted. Not issues whatsoever. Good to hear :). Thanks for the input. I have a psp 3001 ofw 6.31 and use the mina exploit to get 6.31 pro and load using Prometheus and works fine for most isos. Now my question —> is there any way to make it permanent 6.31 pro without taking the chance of ending up with a brick in my hands? I would like to just turn on my psp and run Prometheus and play the game, is there any way to do that? also is there any way of running psx games on my version? The CIPL flasher is meant to make this LCFW permanent but it won’t work for you since you’re on a PSP-3000. hi, can i use the iso loader on my psp running on 5.50 prome-3? i have some iso games that dont work in prome-3. im wondering if this would be a valid work-around. No it won’t work, compatibility with games for 5.50 + prometheus-3 is much better than the Prometheus ISO loader. Since you’re having problems with prome-3, upgrade to prometheus-4. Also, consider getting isos that are either unpatched or patched specifically for 5.50. Ah.. I’m currently having problems receiving mail because of our office’s firewall (so usually I get to read the mail when I get home). There’s really no list like this one for manually patched games because users do the patching and make it work for their firmware version themselves. The rationale for doing the patching is to bypass the built-in firmware check (DRM) in the game and allow it to run on your current firmware version. To do this, you need a clean/unpatched ISO file of the game you want to play and a plugin for your PSP called the ISO Tool. If you do this, there’s a 95% chance that the game will work on your PSP. Theoretically, it should work with any firmware but since Sony introduced multiple PSP hardware iterations and firmware versions, this just isn’t true anymore. Now if you don’t want to deal with patching things yourself, you have two choices: One is to have the prometheus module, prome-3 and prome-4 in this case, to decrypt and patch the game on the fly as it loads on your PSP. This, as you are experiencing is a hit or miss thing. The other choice is to get a copy of the game that’s already patched for your CFW version or lower. As an owner of a PSP Phat with 5.50 GEN-D3 and Prometheus-4, for the best compatibility, I always try to look for games patched for 5.00 M33. This way, I know it’ll work (hasn’t failed me ever since I started looking for 5.00 M33 patched games). so prometheus decrypts isos as they load? what im experiencing is mostly a miss or miss thing lol.. but how do i know whether an iso is patched for 5.50? is there any indication on the file itself or from the source? i got all my files ol, so naturally they come from diff sources. i’ll reload prome-4, AND try to find this iso tool (do u have it here btw?). if it still doesnt work what else do u think i can do to rectify this issue? usually a game is indicated as patched for etc etc (ie patched for 5.00 m33, patched for 5.50 gen-d3) from where you are downloading it. If it’s not listed as such, download elsewhere :). I would upload the ISO tool but the site is blocked from work :/ As for what else to try, try swapping game files with friends. right. theyre all on prome-4 and all they play is monster rancher lol. thanks berimeni for the advise. keep on keeping on 🙂 ur doing the lord’s work. hi i’ve updated the pspgo to 6.31 Hen PRO + Prometheus ISO loader. Managed to get it running by following your instructions. Thankyou so much. If I remember correctly, this is a known bug with 6.31 and 6.35, ad hoc. I’ll check with my sources. Also, now that I have a PSP GO I will test this myself. Looks like it’s a problem with 6.31. I was able to connect my PSP Phat with 5.50 GEN-D3 and my PSP Go 6.20 TN-C in a battle. I would recommend downgrading to 6.20 ofw using the 6.20 downgrader then install 6.20 TN-C.
Are you trying to load games via the XMB or via prometheus? uhhmmm, both actually. and both are not effective. 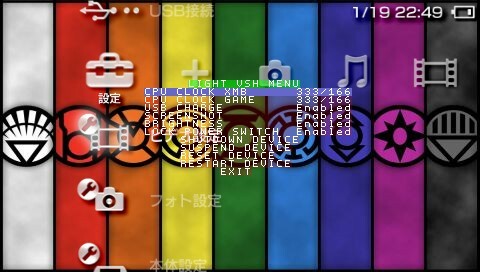 VSH menu doesn’t appear but my PSP displays 6.30 pro, any advice on the vsh menu? Did you install the Light VSH menu included in the list above? If yes, check if the vsh.txt file has the right line of text to make it run. To add on: I tried playing Valkyrie Profile Lenneth using the Prometheus Loader, the screen go black and shuts down, then when I turn it back on and try loading the loader, it says game corrupted, I immediately check the system info. What shock me is that it displays OFW 6.31, Any advice? Nevermind I know why the game doesn’t work. Now the question is why the PSP change back OFW 6.31. Ok, we will have wait for it then, thanks for the info. Ok, one more question, can I use cwcheat with this? I posted a problem at ChickHen R2 page but it seems that the page having problem, I will just ask here. I have a PSP 2000 with hackable motherboard (HJ serial code) and OFW 6.31. Tried installing ChickHen R2 using the easy installer but it doesn’t reboot and system info remains unchanged. Any advice? It could be your memory stick. A lot of ChickHen related problems are due to incompatible memory sticks. I see… Oh well, I will just stick with the 6.30 Pro then. thanks. 6.31, do i need to upgrade it to 6.35? -Still nothing happens when I press Select. 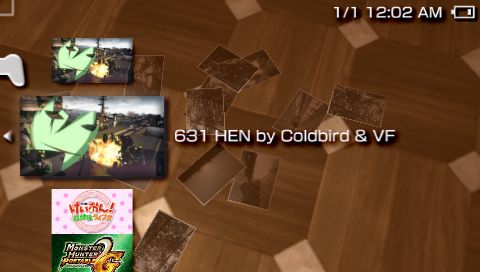 -631 HEN br Coldbird & VF, loads the PSP game opening slightly lagged, then goes into a black screen for a second, and then returns me to the XMB. The Prometheus ISO Loader appears to be working fine, although I have not tried to load an actual ISO with it, I was able to load and then exit the program without issue. Any idea if it’s me or the PSP Go? I think you haven’t placed the plugin in the proper directory. I tried the new file you provided, and received the exact same result. The contents were “ef0:/plugins/vshmenu.prx 1″. I deleted the ” 1″ and saved. ahh I think I know the problem. I guess it’s a bug then. So does that mean I can’t really do anything else? Do you think I’m safe to try the ISO Loader? Have you tried turning off your PSP then re-running the signed 6.31 Hen installer AFTER editing the vsh.txt file? Just tried it, and still the same. Stupid question, I can only run PSP ISOs on it, correct? Not PSX ISOs? yep. If you want PSX games, you may want to consider installing 6.35 Pro-B. when i load my ISO, it becomes a black screen, does it mean the ISO is not supported?? btw im using 6.31ofw any ideas? please help me on my problem regarding on my psp 6.31 version. i can’t load my favourite game which is valkyrie….it turns black and sutdown, same as the other user,….hope you can help…tnanks. 6.31 Pro is really just temporary. As of now, there is no real way to install a full custom firmware like 5.50 GEN-D3 or 5.00 M33-6 on non-hackable PSPs. You can upgrade to 6.35 Pro-B6 as it’s pseudo-permanent. do we still need the demo from the original hen? I would recommend upgrading to 6.35 OFW and install the latest PRO LCFW release. Hi, i have the 6.31 PRO on PSP 3000. i had problems with some games that would cause the screen to turn black and shut down the psp when you choose them on the Prometheus Iso Loader. will the Signed 6.31 Hen PRO solve this problem? also, do you recommened any better CFW that will solve my problem? Since it’s still using the Prometheus ISO loader, installing the signed version won’t really help.